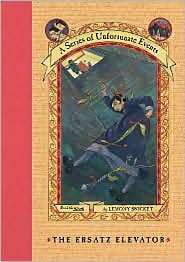 Since I started blogging I haven’t see a review of any of the books in “A Series of Unfortunate Events”. Doesn’t anyone read them or am I behind the bandwagon again? I’m not completely and utterly in love with the series and they do become a bit repetitive after a while, but they’re 1) still entertaining, 2) a fast read, 3) I love the illustrations and binding, 4) I want to know how it ends and 5) I enjoy all the literary references. In The Ersatz Elevator, the Baudelaires’s guardians are Jerome and Esmé Squalor. Esmé is the city’s 6th most important financial adviser and so incredibly wacky she became one of my favorite villains in the Series: she’s obsessed with what’s “in” and “out”. For instance, the children have to climb 66 floors to get to the Squalor’s apartment because elevators are out, but on the other hand, pinstripe suits and ocean decorations are in. Although Jerome was kind to the children, he turns out to be yet another negligent guardian. Why are all adults in the Series either villains or fools? Maybe that’s why The Reptile Room is still my favorite book so far – Uncle Monty rocked (and I liked him the movie as well)! As the story of the orphans progresses, my curiosity increases over the pieces of information Lemony Snicket drops about himself. I love how sometimes he’s telling the story and all of a sudden he says something like, “and this reminds me of the time I was in prison for biting a dog”. I hope in the end we find out more about him and his dear dead Beatrice (For Beatrice- You will always be in my heart,/In my mind,/And in your grave.). There are many, many things that are difficult in this life, but one thing that isn’t difficult at all is figuring out whether someone is excited or not when they open a present. One of the greatest myths in the world – and the phrase “greatest myths” is just a fancy way of saying “big fat lies” – is that troublesome things get less and less troublesome if you do them more and more. People say this myth when they are teaching children to ride bicycles, for instance, as though falling off a bicycle and skinning your knee is less troublesome the fourteenth time you do it than it is the first time. The truth is that troublesome things tend to remain troublesome no matter how many times you do them, and that you should avoid doing them unless they are absolutely urgent. The world ‘bubble’ is in the dictionary, as is the word ‘peacock,’ the word ‘vacation,’ and the words ‘the,’ ‘author’s,’ ‘execution,’ ‘has,’ ‘been,’ ‘cancelled,’ which make up a sentence that is always pleasant to hear. I’ve also noticed that they aren’t very popular in the book blogging world, but I used to love the series. I read through book eight but gave up because, like you said, they do get repetitive after a while. You have summed up my feelings about the books perfectly! I’ve been reading two or three each year for the past few years (just finished Book 11) and I know I’ll complete the series for the exact reasons you mentioned. But I agree, they get repetitive and a bit frustrating. The Reptile Room is my favorite as well. Sometimes I just want to smack the other adults. The author’s funny quips and clever wit make it all worth while though. I read the 1st, the 2nd as well I think. cute books but not enough pay-off of any kind to keep me reading the series somehow. Just to add “Why are all adults in the Series either villains or fools?”, you know maybe it is not just this series. A lot, including some crucial stuff, of children´s and YA lit depends on just that. Or if not fools or villains, at least on adults being absent. These do get repetitive, but like you, I still find them entertaining. I don’t even remember which one was the last one I read, but I’ve listened to many of them on audio. I love it when Tim Curry is the reader, but on some of them the author reads, and I don’t like it at all! I love this series. When I read the first few books, I almost laughed myself sick. And the hardcover books themselves are just lovely little objects. You’re right that they do get repetitive, but the story gets more complex, too, which kept me interested through the whole series. @Melissa: Yep, that’s my average as well: 2 or 3 a year. Maybe in 2011 I’ll pick up speed! @T: Is that how we felt when we were kids? I don’t remember that, but maybe all adults were The Others then. @Shelley Z.: I was thinking about getting some of them in audio, but the editions are so pretty! @Teresa: I feel it’s getting more complex (which I welcome). Little details like the dedications, the teaser-letters at the end or even the author’s and illustrator’s biogs (big lols there!) make it all worth while! I don´t think it is about adults being the others, but that for children to be suitably heroic good parental or adult things around would surely solve the *problem*, or protect them for it. Which maybe is why there are so many orphans in literature and fairy tales – it´s not that we want, even when children to be in that position, but that for chidren to be heroic there must be no good responsible capable parental figures – or they would protect them from it. Unless of course is something adults can not protect children from. I have only read the first Lemony Snickett book and I did enjoy it, though like you said, they can get repetitive. I do think Snickett’s humor is so great, however, and if I had kids I could see these books being tons of fun to read together. The Ersatz Elevator (A Series of Unfortunate Events #6) by Lemony Snicket | Fantasy Books!